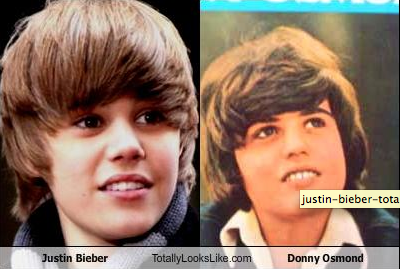 This too funny, I've heard a lot about Justin Bieber but I've never see pictures of Donny and Justin together. Too crazy! As I looked more and more at the pictures, they do look alike and their story is very similar. Its funny to hear Donny joke about it as well... he is being compared to teenager- Donny must look young haha. That's awesome! Same hairstyle and everything. ive seen lost of these pics,all donny look alikes. Brandon says your like boy is not well,try tilting his head end of his cot,with a book or two,so his chest wont get congested,and his nose wont get as blocked up,it worked for mine when they were little. That's crazy!!! I love that the hair-do is the same so many years later!!! Your blog is so cute! I used to be a fan of donnys when he looked like that when i lived over in england. I only saw justin for the first time the other week on tv and i admit i had to do a double look also. It really is pretty funny. Wow! That is some comparison! I had no idea! What does Donny think of that? And yeah . . . Donny is cuter! You know since I am using spectrum charter internet services from https://www.bestbundlepackages.com/ I only search about Justin Bieber on internet.